happy to have this original from the era of creativitiy in house music. pure gold! 2018 repress is now available. According to Fresh & Low on Facebook: This is the very last vinyl re-pressing of the Little i EP so get it while stock still last. Don't say I didn't warn you..
Thankful for this repress. It sounds great. 20 years old now! Essential one, must have in a collection! "Dream" is perfect. classic and essential listening. 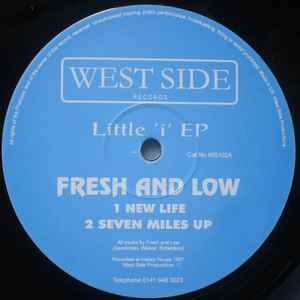 New Life is the track I show to my friends who don't listen to deep house when they ask what deep house is, and Seven Miles Up is also a highlight. You have all said it.lol best deep house record ever.not to be repeated. I was fortunate enough to pick a copy of this up on release, thanks mostly to having a NG7 postcode. At the time I was living in Nottingham and immersed in electronic music - Nottingham was at the time a hot bed of all things deep house such as DiY, Charles Webster, Remote Records, Nail, etc. served through some great record shops. And this EP was one of my best purchases ever. 'All The Way Back' is a bona fide killer cut and burned into my memory. That vocal hook 'You gotta keep on, I gotta keep on' works so well. Every time I played this out I was always asked 'who is this ?!'. In short its the stand out track on an outstanding EP. The cut mixed great for me going into Swayzak ‎– 'Burma Heights'. So pleased this has a re-press as so many more people now get to hear this wonderful EP in full.